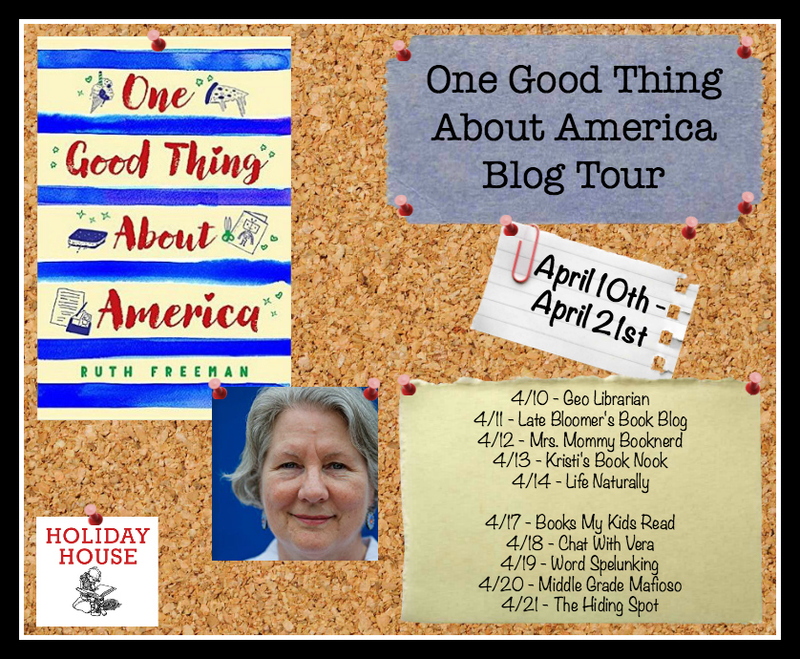 One Good Thing About America Blog Tour! 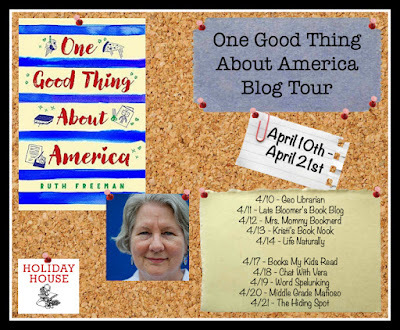 To celebrate the release of One Good Thing About America by Ruth Freeman (3/14/17), blogs across the web are featuring exclusive content from Ruth and 10 chances to win a copy of One Good Thing About America, as well as a chance to win a Skype visit with Ruth in the Grand Prize Giveaway! Let me introduce you to the world of an ELL teacher, the best part of which is the students themselves. Some come with years of English, some come with no English at all. They may be young or fairly mature but, being in a totally new environment, they are looking for our help. Because we work with them one-on-one or in small groups, they tend to be a bit more relaxed about talking and asking questions. It is such a privilege to watch them open up and to help them adjust to their life in America. We do everything we can to help them settle in to our school and begin to feel like they’ve found a home. We work hard at pronouncing their names correctly! In my story, One Good Thing About America, Anaïs’ teacher and the students have a hard time with her name, so she becomes Annie. Some of the students at my school have also chosen to go with more Western sounding names. Because the ELL teacher is often a liaison between school and home, we try to find out as much as we can about the family’s story without prying. We will gradually learn more and more about them. Another part of our job is advocating for our students in our school. Do they have what they need? Can we get them into an after-school program? Sometimes we’ll organize all-school events like a Flag Day, a Multicultural Day, or a community dinner. Through a screening process we find out how much English they know and then plan how best to support them either in their classroom or in small groups we pull out. This year, besides working with students in their classrooms, I have three groups of 3rd, 4th and 5th graders I pull out for math. We are currently trying to get our heads around multiplication and arrays. Like Anaïs, my students like math because numbers are the same in any language! It can be a relief to see familiar numbers again. Of course, story problems are something else again, as Anaïs discovers. So many words asking about stickers or flowers or cupcakes! We will often write our own story problems using the students’ names and pizza…because everyone knows and loves pizza! Stop by Late Bloomer's Book Blog tomorrow for the next stop on the tour! 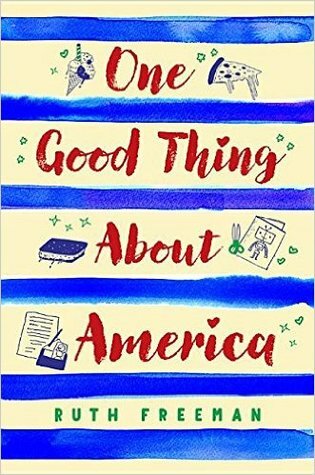 ONE GOOD THING ABOUT AMERICA is a sweet, often funny middle-grade novel that explores differences and common ground across cultures. It's hard to start at a new school . . . especially if you're in a new country. Back home, Anaïs was the best English student in her class. Here in Crazy America she feels like she doesn't know English at all. Nothing makes sense (chicken FINGERS? ), and the kids at school have some very strange ideas about Africa. Anaïs misses her family . . . so she writes lots of letters to Oma, her grandmother. She tells her she misses her and hopes the war is over soon. She tells her about Halloween, snow, mac 'n' cheese dinners, and princess sleepovers. She tells her about the weird things Crazy Americans do, and how she just might be turning into a Crazy American herself. 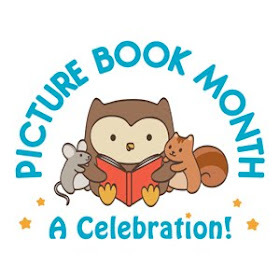 About the Author: Ruth Freeman grew up in rural Pennsylvania but now lives in Maine where she teaches students who are English language learners, including many newly arrived immigrants. 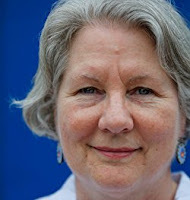 She is the author of several acclaimed nonfiction picture books. 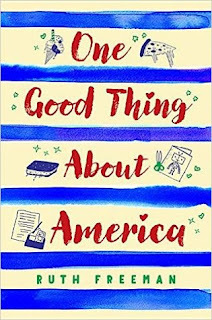 One Good Thing About America is her first novel..
Ruth Freeman has written a tender story about a young girl from Congo who finds herself attending school in Maine, USA. While she herself admits that she hasn't experienced this for herself, she has spent years working with children who have. Anaïs writes letters to her beloved grandmother who stayed behind in Africa while Anaïs, her mother, and her younger brother Jean-Claude have come to the states to find safety. Unfortunately, Anaïs's older brother and father remain in Congo, her father in hiding. Her father attempted to reveal the unethical and illegal things that the mining company he worked for was doing and as a result risked his own life and that of his family. Anaïs's letters show her confusion with the happenings at her school and 'crazy' America as a whole. Her struggles to learn the language, make friends, and learn the customs and traditions of her new country frustrate Anaïs greatly. But her grandmother's suggestion of finding one good thing about America to share in each letter helps her begin to see the good in her new life. Those of us who've never experienced what children like Anaïs have need books like this one to help us catch a glimpse of what it's like. Ideally, as the author points out, these children would be telling their own stories, and hopefully one day they will. I enjoyed reading about America from the perspective of someone new to the country. And I definitely empathized with Anaïs's struggles to fit in as well as find a new home that she can love as well as she did her old home. The somewhat broken language and deliberate misspellings made it harder to read than some books but shows the reader what it might be like to try to communicate in a language you are just learning. An important story that would make for a great sharing opportunity. 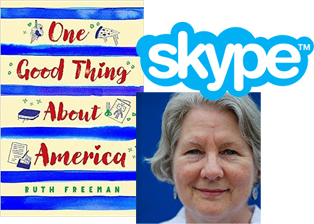 One (1) winner will receive a signed copy of One Good Thing About America for their personal collection, as well as a 30 minute Skype visit with Ruth Freeman to the school of their choice and a signed copy for the school's library. I thought that the Anais' voice was SO much like many of my ELL students, and their teacher loved the ARC. I also really like the name Anais; it reminds me of my favorite perfume! Can't wait to have this one on the library shelves next year. Thanks for this meaningful and special feature and giveaway.